For the second straight year, the University of Missouri College of Agriculture, Food and Natural Resources has produced its “Road to Discovery” magazine, highlighting the diversity and uniqueness of its Agricultural Research Centers. The Research Centers are spread throughout the state, extending CAFNR’s research to more than 14,000 acres to meet the regional research and demonstration needs of agricultural producers and natural resource managers. Each Center hosts a variety of activities throughout the year, including numerous community outreach events. 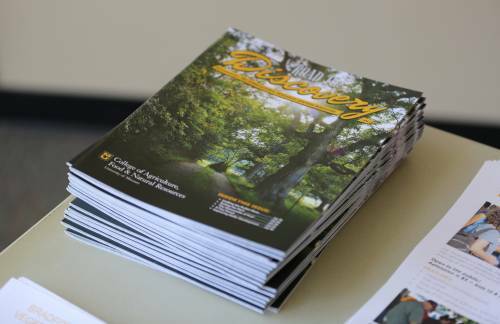 The magazine highlights how the Research Center engage with local producers and provide Mizzou … Expand ▸The magazine highlights how the Research Center engage with local producers and provide Mizzou students with research opportunities. Physical copies of the magazine are available at each of the Research Centers. There is also an online component, with a link to the magazine on each of the Center websites. The magazine also brings to light the unique partnerships the Agricultural Research Centers have, including with the CAFNR Foundation, CASE IH and the Ellis Fischel Cancer Center. This year’s issue showcases just how different the research at the Centers can be. The Missouri Bootheel region is home to the Fisher Delta Research Center, which boasts a nationally-recognized soybean breeding program. The team releases three to five new varieties into the market every year – with a focus on higher yield, disease resistance, environmental stress tolerance and improved seed quality. At the Foremost Dairy Research Center, in the central part of the state, genetic testing has produced better performance results from dairy cows on site. The Hundley-Whaley Research Center, located in the northwest part of the state, is studying soybean cyst nematodes, a costly but hidden pest for farmers. The magazine also highlights how the Research Centers engage with local producers and provide Mizzou students with research opportunities. Physical copies of the magazine are available at each of the Research Centers. There is also an online component, with a link to the magazine on each of the Center websites. The magazine also brings to light the unique partnerships the Agricultural Research Centers have, including the CAFNR Foundation, CASE IH and the Ellis Fischel Cancer Center. “These partnerships are vital to what we do,” Reinbott said.